The Tisdale Aviation Association/ COPA Flight #93 is active at Tisdale Airport, CJY3. Association members make available 100LL Avgas and oil. There is no callout charge for after hours fuel. Tisdale Aviation Association/ COPA Flight #93 sponsors two major events each year. They fly the COPA for Kids Aviation Program and they provide a Sunday morning Fly-in, Drive-in Hungry Person’s Breakfast in conjunction with Motor Madness Weekend. Tisdale Aviation Association/ COPA Flight #93 has regular meetings on the third Monday of each month September to June. Everyone with an interest in aviation is welcome. The President is David Lamb (306-873-2718) and the web master is Charles McKenzie (306-863-2999). The Tisdale Airport Terminal Building has a lounge, telephone, washroom and wireless internet. The phone number is 306-873-4300. For information about the town of Tisdale phone 306-873-2681), or Town of Tisdale. The Airport has a paved runway 14/32 with ARCAL lighting activated by keying the mic 5 times on the Air Traffic Frequency 122.8. Navaid at Tisdale is NDB 295, Ident. [ E 2 ]. Rwy 32 is on a bearing of 329 at 2.3NM from the NDB. There is no winter maintenance of grass runways, 08/26, and 17/35. NOTAM: There is extensive bird activity next to the waste disposal site adjacent on the south end of threshold runway 32. Can you indentify this airplane? Or the builder? The airplane is "Little Snooker". Posing beside the airplane is its builder Fred Williams of Tisdale, Saskatchewan. 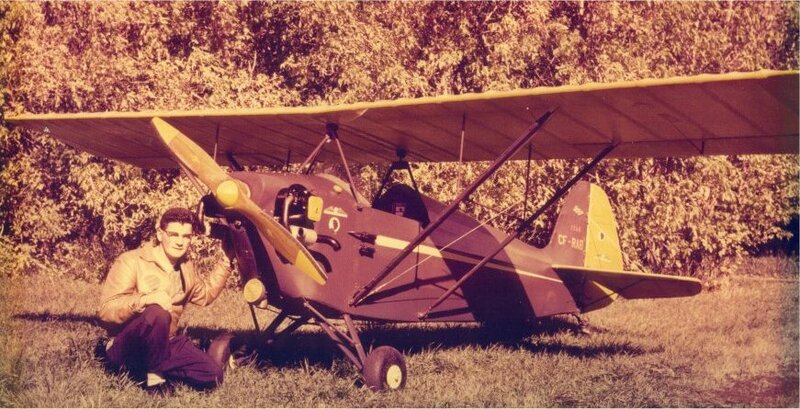 Fred was one of Canada's pioneering aircraft homebuilders.He designed the plans in 1950 and completed the aircraft in 1957. The aircraft was registered as CF-RAB and was issued Flight Permit No. 001 under the "ultralight Aircraft Category", now known as "Amateurbuilt". This High Wing Parasol took five years to build, had a 40 hp 2 cylinder engine and a top speed of 85.mph. The new Sensenich prop cost $85.00. Fred Williams passed away on February 28, 2002.